Centsible Savings: Sears promotion on Men's clothes - spend $50 get $50! Sears promotion on Men's clothes - spend $50 get $50! I wanted to post this just in case you missed it in your Sears flyer in yesterday's paper. It could be a good deal if you were needing some new clothes for your husband or boys. 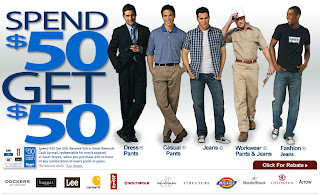 Here's the deal - purchase $50.00 in men's clothes (pants or jeans) at Sears by June 21, 2009 (Father's Day) and get back $50.00 in Sears Reward Cash. The Sears Reward Cash can only be redeemed on any men's apparel and can be redeemed from 7/1/09 - 10/29/09. A great idea for Father's Day too as you could buy your Father's Day presents and then go back and buy $50 more in clothes using your Reward Cash. Go here to Sears website for more information and you can print the rebate form here. Or you can submit the rebate online here.